It was a lazy Sunday evening. The attendance in the newsroom was very thin. Our quintessential Bhatt Sahib strolled down the aisle of newsroom where our Sport in-charge sits said something about ‘Dahakti Jawani, Mahakta Husn‘. I was busy giving final touch to the Prime Minister Narendra Modi’s speech which he had delivered during Ground Breaking ceremony in Lucknow that very afternoon, but those words drew my attention. I was bit alarmed too because a girl was working in that newsroom and out of the blue Virendra Nath Bhatt, to us Bhatt Sahib, said in his baritone Dahakti Jawani, Mahakta Husn, which had no reference to the working in newspaper office. I then realized that Bhatt Sahib and our Sports in-charge Shalabh Saxena were having a discussion on launch of new tabloid. I was aghast. Can a new tabloid or newspaper have such a weird name? Though I have come across very creepy titles of newspapers like Tumahri Muskan, App Ka Wafadaar, Tehare Liye etc but the name like Dahakti Jawani, Mahakta Husn has crossed all the limits. “The only name left is Dahakti Jawani, Mahakta Husan otherwise people have got all other titles registered. I will suggest if someone is trying to get a new title he should go for this name. This title is an eye catcher and has high salability quotient,” Bhatt Sahib said as he strolled towards me. “Do you know there are newspapers called Ravan Ki Munch aur Angad Kaa Paav and even Mafia Times, Bhatt Sahib said. I am in no position to contest Bhatt Sahib’s claim because he is repository of information. But can there be a newspaper with a title Ravan Ki Munch aur Angad ka Paav. I don’t know. Bhatt Sahib might have said something in a jest but he has hit the bull’s eye. 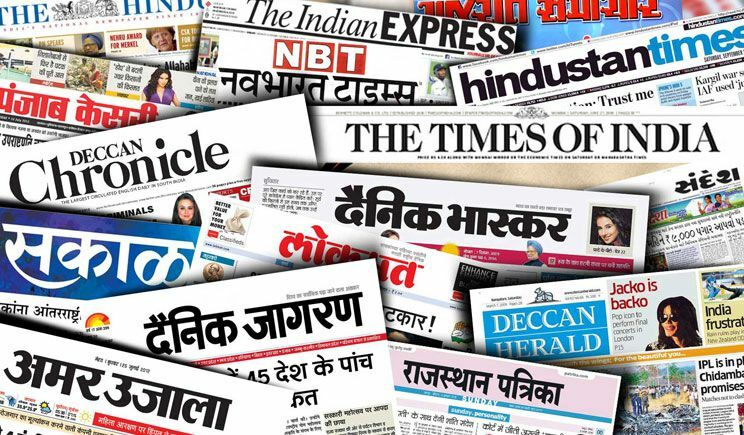 In Uttar Pradesh itself there are over 30,000 newspapers, tabloids or magazines (weekly and monthly) registered with Department of Information and Publicity, but hardly one-two per cent of them are visible in the newspaper stalls. The rest operates just on paper – literally. The biggest challenge for the new entrant in this trade is finding a suitable title. All the possible names have already been registered. Some innovative brains manufacture names adding ‘Times’ or prefixing ‘The’ with any name. But these never catches eye. The sleazy title which Bhatt Sahib suggested could be a ‘show stopper’ but I hope RNI (Registrar of the Newspapers of India) should not allow such titles, otherwise next time we will have a newspaper with more creepier title. Never imagined that there may be so many interesting newspaper titles. Very strange to know but interesting.